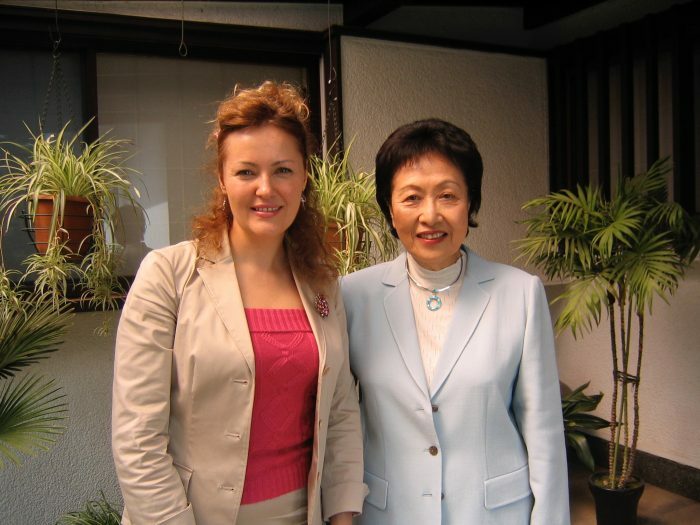 Japanese author Ayako Sono interviewed by Judit Kawaguchi in 2006. Prominent on Japan’s literary scene for over half a century, Ayako Sono is one of this country’s best-known writers of fiction and essays. Sono rose to prominence with the publication of “Enrai no Kyakutachi” (“Guests from Afar”), the story of a young girl’s perception of the U.S. Occupation forces, which was short-listed for the prestigious Akutagawa Prize in 1954. With that, Sono established herself as a member of the first wave of talented women writers to appear in the wake of the Second World War. Highly regarded for her informed, eloquent style, Sono has written extensively on social issues of the day from the perspective of a Catholic woman. With over 40 novels and essays to her credit, she has seen her work translated into six languages. As well, Sono has made a name for herself as a tireless advocate of human rights and is the energetic chairperson of the Japan Overseas Missionary Assistance Society (JOMAS), a charity she founded in 1972. The author and social commentator talks to Judit Kawaguchi. Judit Kawaguchi: When did you get involved with charity work? Ayako Sono: About 34 years ago, I collected money for a South Korean leprosy village, whose director, the Reverend Lee Kyun Che, was an acquaintance of mine. Also around that time, I went to Madagascar to do some research for a book. I stayed at a Franciscan missionary post and learned about three nuns who worked as midwives there. Seeing their daily struggle, I became convinced that I had to help. One way was by writing about them, and the series The Babies for Whom Time Stopped, published by the Mainichi Newspapers, turned the spotlight on their amazing contribution, and the donations started to pour in. JK: Who are the main sponsors of JOMAS? AS: Ordinary people. I believe in reaching out to individuals, and although we also now have the support of two or three company presidents, the rest of our members are average citizens who send us amounts they feel comfortable with. Every year, somebody might wire us the few hundred yen they saved over New Year’s by not having bought a second soft drink or something. Such people never quit helping us, though large corporate donations can dry up the moment business turns bad. JK:Collecting money must be a very time-consuming and difficult process. AS:It is, but we have over 2,300 members who are firmly behind us and they entrust us with over a hundred million yen a year. I often joke that my God is not in a chapel but in the casino. It was in Madagascar, on my last day there, that I went to the Hilton’s casino in Antananarivo to try to win money to give to the Franciscan nuns. I sat down, prayed and promised that I would give all the money to them. I won at roulette twice in a row. I won a few hundred thousand yen and donated it to the three nuns. JK:It sounds like your prayers were answered. AS:Yes. And interestingly enough, my luck continued even after I returned to Japan. At that time, everyone thought that only large, tax-free donations were a viable option for a charity, but I disagreed and collected from individuals little by little. I’ve never changed my tactics, and time has proved me right. JK:What distinguishes JOMAS from other NGOs? AS:We have a very strict checking mechanism. We never send money to groups or foreign government organizations – only to Japanese Catholic missionaries living abroad. They are completely responsible for investigating thoroughly every request, and they continue revisiting the recipient to make sure that some item we purchased is used and maintained. Let’s say, some village would like solar panels to generate electricity installed on a building, and the price tag is ¥1.5 million. Our member – a priest or a nun in that area – will be involved at every step of the process from purchase through to running and maintenance. He or she makes rounds in the area and listens to what the locals need, and we try to accommodate their wishes. JK:How are you involved in the day-to-day management of the group? AS:Oh, very much. I oversee the finances and regularly visit our members abroad. I’ve been to about 85 percent of the places where our members reside. I must have visited about 115 countries, and most of those are in the developing world. Another feature of our organization is that our running costs are zero. I pay for all my transportation out of my own pocket, and our meetings abroad are simple affairs. We eat whatever the locals eat. Food in itself is a treasure, although living in Japan or any other advanced nation one might forget how many people have nothing at all to eat. JK:You must have had such experiences during the Second World War. AS:Yes, we were so poor, and I do remember those years. Now, Japan is a sort of heaven. In a way, our wealth is the reason why even younger people who do not work are able to live off their parents. If you call for an ambulance here, it comes within minutes and takes you to a well-equipped hospital. In many countries, they don’t have such hospitals, and unless you pay, the ambulance won’t even take you. Most Japanese don’t know how much hardship some people in the rest of the world have to endure. As a result, they don’t realize how special Japan is. JK:What do you find most different abroad? AS: I think the gap between the rich and poor might the smallest in Japan. For example, Sony’s co-founder, Mr. Morita was of course considered a rich man but his lifestyle was not so different from the average Japanese. His wealth was nothing compared to the fortunes of Bill Gates or Michael Jackson. No matter what position or job, all Japanese live in fairly similar, reasonable houses, and have just what they need. Even presidents eat simple food, such as mezashi, a kind of small dried fish and hijiki, a type of seaweed. I find that in Japan it is easy to take everything for granted, such as clean running water, comfortable toilets and cities where everything works perfectly on a precise schedule. When I’m abroad, whether it’s New York or Bangalore, I frequently experience blackouts, yet we never have those in Japan. The more one travels around the world, the more it becomes obvious what an amazingly well-run country Japan really is. JK:Many of the female characters in your book No Reason for Murder seem rather trusting individuals and one by one they become victimized. AS:Yes. One has difficulty understanding why such people are like that. I actually find the immaturity, the childishness of the Japanese, slightly annoying. Most parents do not teach their children that humans have faults and that there are some scary people around. I guess I’m very outspoken and selfish, in a way, so I always wonder why others don’t think more seriously about their actions and what the consequences of those actions might be. It’s said that the children of wealthy people are often not so sharp, and since Japan is a developed nation that might be a little true for most of its citizens. JK:What do you learn abroad, and how do you incorporate those experiences into your writings? AS:I learn from every country and group I visit. I can see both the beauty and the shortcomings of Japan when abroad. I love the Arabs and have visited many countries where they live. Arabs normally don’t use water from others people’s wells without permission. But in an emergency, they share food and water even with their enemies. They understand that suffering is universal and shared. JK:Many Japanese go abroad but few venture to places you do. AS: Yes. Many Japanese fly to South Africa to take the Blue Train and enjoy a luxurious safari. But when I go there, I go to the Aids Hospice run by Nicolas Nemoto, a Catholic priest we support. So far, we’ve sent him about ¥40 million so that he could build a mortuary and hospital wards. He’s been able to purchase a bus to transport orphans and SUVs for traveling on rough roads. We also paid for a treatment center he runs for recovering alcoholics. JK: Have you thought about helping Japan in some way? AS: No, not really because Japan is rich so it doesn’t need my help. When South Korea was less developed, we supported people there but not anymore since South Korea is doing very well economically. JK:How would you describe yourself? AS:I think I spent my whole life passively following the road that was somehow marked out for me. I could say I followed my destiny, with a kind of “let it be” attitude. As a child, I was bad at sports. I was very shortsighted; I couldn’t paint; I wasn’t good at arithmetic. All I could do was write. I was raised at a convent school and usually stayed in, reading books. By the time I was 12, I was writing stories. I’ve always done what I felt like doing and what I think others would not want to do. 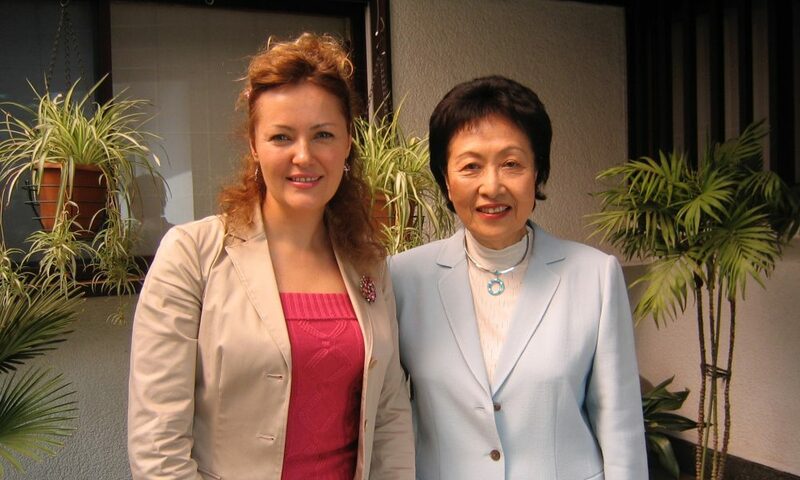 In 1995, I accepted the position of chairperson of the Japan Foundation because I recognized that nobody else would want to do all that work for nothing . So I said yes to the challenge and worked hard there for almost 10 years. JK:You’re fluent in English. What do you think about the English education in Japan? AS:Basically I agree with English tuition from a young age because I also began in kindergarten. I went to a mission school, where the nuns told us that in order to be international, we first had to be national. In other words, we had to learn Japanese customs and culture too. Among children today, I don’t think mobile phones and TVs should be used for more than an hour or so a day. The rest of the time, children should play together or read books and write reports. Morals have to be taught, too, along with common sense, such as not buying something unless one has money. JK:In many Japanese schools, literature is taught by reading just a few pages from novels, without finishing the whole book. AS:Yes. That’s terrible. When I was a child, we read a lot: the only fun we had was the radio, and even that wasn’t so great. So we either read or went outside to play. We had to prepare book reports, too. I think schools should make kids tougher. I disagree with the use of too many conveniences for children from such a young age. Children should use air-conditioning less, and there’s no need to ride on a school bus for a short 1- or 2-kilometer walk. Children need to bring lunch boxes from home, made by their mothers. I think children must learn endurance more. JK:What has been your philosophy? AS:I walk my own way, but I try to do so with consideration for others. I see the good in people, but I know that not all humans are wonderful creatures. The bad is also human. And the dark and the bright exist together. JK: What are you working on now? AS: I am writing short stories and am also researching about Jesus for a book. No, not The Da Vinci Code type of book, though. JK:Unfortunately many of your books have not been translated yet. AS:Yes, I know but I guess the foreign market must be very small for Japanese literature. I don’t really care either way, actually. Of course, I would be happy if some of our literature was more known but as far as my own books go, I do not care. I guess I am living in my own world, which is rather small, but still has great depth and wide horizons. If I were not happy here, maybe I would have chosen to be a politician, not a writer. JK:You once suffered from depression, but recovered. Do you have advice to those who are currently feeling down? AS:People shouldn’t believe that they should stay in a particular job no matter what the cost. If the work they do makes them miserable, they should be brave and move on. Changing jobs could be one way to recovery. Or finding one’s talent is another. I was helped by a doctor who asked me why I felt so much pressure about producing books. I realized that I could just write when I wanted to, and that thought pretty much cured me. JK:You and your husband, writer Shumon Miura, are famous for your happy marriage. What’s your secret? AS:We have similar hobbies and dislikes. Also, we both hate being busy and being rushed. JK: If you were not writing, what profession would you like to try your hands at? AS:I admire craft-working, and if I could, I would like to be a furniture-maker. More specifically I would like to work with sashimono, which are boxes and chests created with highly precise joints that keep the parts in place, without the use of nails. I respect the accuracy and precision of Japanese crafts. I think we could develop the computer chip because of the background of our craftspeople who spent a long time improving details that nobody can even see. That is the depth and beauty of Japan. A version of this interview appeared in Skyward Magazine in 2006.